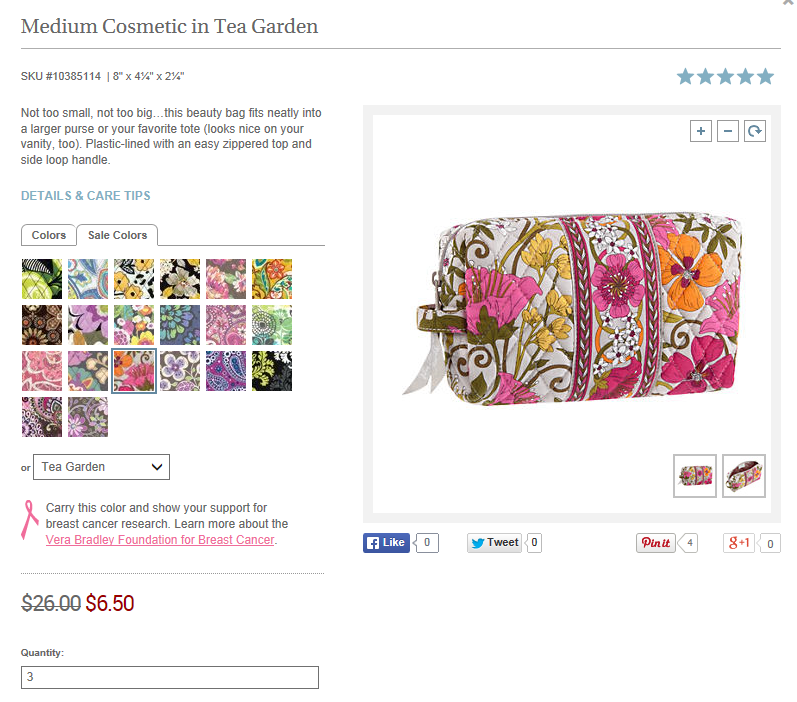 Today for four hours only, Vera Bradley has 75% off Tea Garden. What an amazing deal! Too bad their website can't seem to mange inventory well enough during a sale. 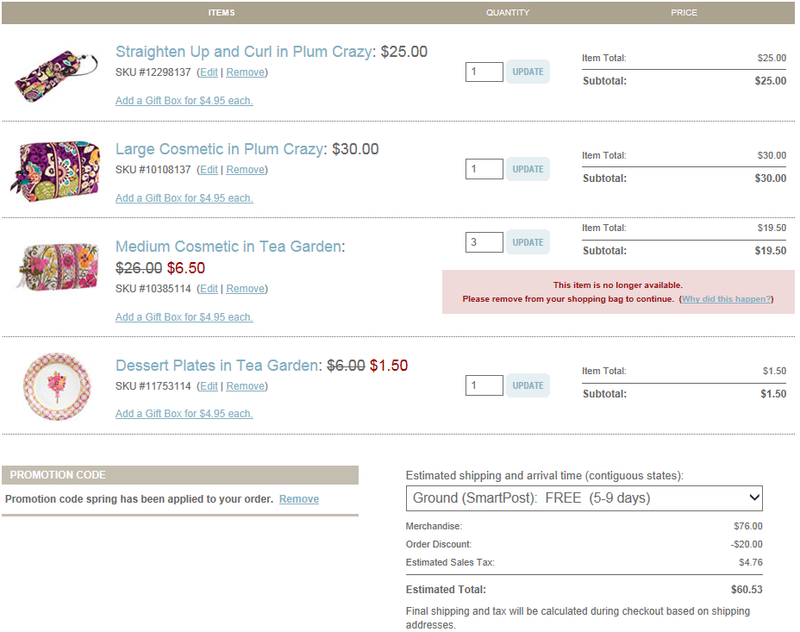 I was able to successfully add 3 Tea Garden Medium Cosmetics to my shopping cart and proceeded to check out. I kept getting an error at check out, but it wouldn't tell me what the error was. It kept saying see section in red, but nothing was red. So I went back a page and saw that while I was putting in my credit card number to check out, the item sold out! Most online shopping sites will at least hold the item for you while you are completing check out. I am really disappointed. But when I went back to the Medium Cosmetic, it is still listed as in stock. So none of their pages match. I decided to call customer service to confirm if the item was sold and she said it was. She also pointed out that on the check out screen it says this: These items are not reserved until you complete checkout. Noted. I guess next time I will have to move quicker, but gees, once I am logged in as me and I am filling out all the required fields you think that I wouldn't have something taken from my cart. I tried to buy several items also and all of the items I wanted were sold out. So disappointing! I tried as soon as I got the email, about 30 minutes into the sale. Oh well. I love Tea Garden! I tried buying several items about 30 minutes in to the sale. Everything I wanted was sold out. So disappointing. I guess you have to buy them the minute the sale starts. Oh yes, this has happened to me before with clearance lapdesks. While I'm shopping around to accumulate more items to qualify for free shipping, they yanked the lapdesks right out of my cart! I called customer service to complain that their software needs a redesign; if inventory is THAT low, please don't allow me to put those items in my cart! Can you imagine if Amazon conducted business this way? Finding one's cart depleted at checkout isn't good for business. UGH.